Mindbodybrew is ultimately about providing a space for written reflection at every step along the yoga path. We hope that by sharing assignments from our Teacher Trainees, we can expand their deep investigation into community-wide dialogue. The following was written by Ashleigh C. Miller in response to her studies in class theme and development. As a yoga teacher there are so many different tasks to accomplish. You hope that your students will progress physically while gaining mental and spiritual benefit; it is this unity that improves the overall health of a yogi. A recent class taught by TaraMarie Perri for first and second year dance students at NYU’s Tisch School of the Arts particularly resonated with me, as its theme so ably encompassed these ideals. 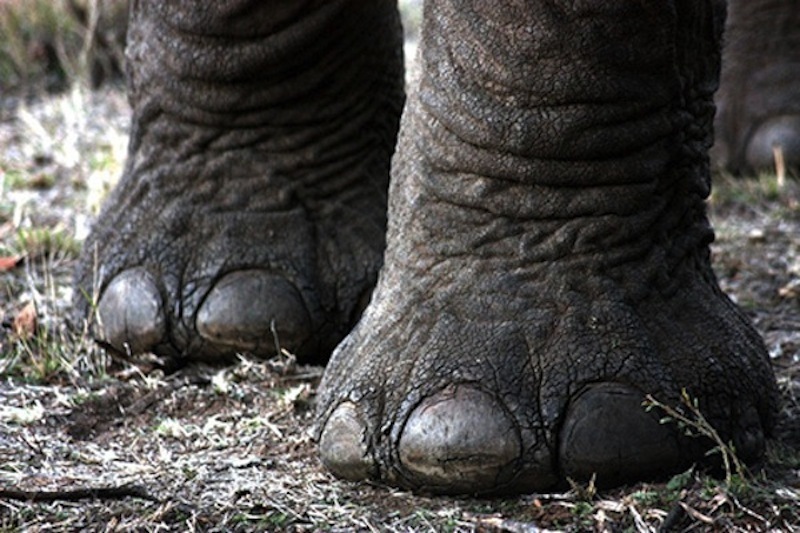 Students were encouraged to picture elephant footprints for the duration of class. Elephant footprints stamp large circles into the earth, wide and stable; yet elephant’s feet, skeletally-speaking, actually are raised like a dancer on demi-pointe. Despite this internal structure, an elephant hardly seems precariously balanced. Internal layers of thick cartilage pad the feet for stability. This anatomical imagery urged students to consider the stability and groundedness of their own feet, to feel rooted into deep footprints. Students began class lying on their backs, feet flat on the floor. One at a time, they raised their legs, a strap around the sole of the foot, and followed TaraMarie’s cues to exert energetic force up into the strap to become rooted up into the sky. The resistance from the strap (pulled in opposing force by the hands) instated a specific feeling that would be carried throughout class. In a short time this energetic experiment made a lasting impression of the feet being able to ground anywhere with stability, whether it was the mat, a wall, a block, or thin air. By the end of class elephant footprints covered the entire atmosphere of the room. What interests me most about this anatomical theme is that it not only encourages correct alignment and body mechanics but, if properly considered, also can be philosophical and energetic in its pursuits. In Pema Chodron's The Wisdom of No Escape, Pema outlines the Buddhist principles of cultivating loving kindness toward oneself and being fully conscious of the present. By taking time to learn about the anatomy and function of the body, we cultivate this appreciation and awareness. By noticing the complexity and amazing intricacy of the body and learning to utilize it in the most responsible way, we honor ourselves. TaraMarie’s theme encouraged students to take the time to recognize all of the internal elements that unite to achieve asana. Even the breath softly rooted practitioners into the ground – inhaling in through the soles of the feet to deeply connect the body and the earth, and exhaling to soften and spread that connection at the feet. Each breath and movement brought a soft stability to the class. TaraMarie’s slightly abstract imagery (obviously we have human feet, not elephant feet) allowed each student the chance to craft his or her own interpretation of the imagistic subject at hand. As I plan classes in the future I intend to develop themes like this elephant foot theme of TaraMarie’s, as these sorts of ideas have an incredible ability to reach a wide range of students and offer vast opportunity for exploration.